I was discussing with a colleague the other day some of the trials and tribulations of modern-day software sales folks. Basically, it ain’t like it was 15 years ago. As my grandmother said — and she has been quoted by so many — the Internet has changed everything! Years ago selling groceries was much like selling anything else. It was about relationships. You walked into a store and were met by the grocer who then took you around the place and helped fill your basket. He was a consultant as much as a grocer. “Mable, this syrup here is made from some mighty fine ingredients…” and the fact that it might be 15 cents higher disappears. And, there was probably only one or two other syrups to choose from. Then came the revolution. Folks started shopping BY THEMSELVES. Shelves had the selections lined up right against each other. Decision making was largely relegated to outside the store via branding and advertising. The “grocer” now just checked you out at the cash register. Sound familiar? About 10 years ago, you could see the barrier to entry starting to fall rapidly in the software market. Infrastructures and frameworks took dev times from years to months. eStores made buying simple and brought every product known to man into one tidy search results screen. Then the “try before you buy” model kicked in, and just like that, the “traditional” role of the sales rep disappeared. Software is getting much, much harder to “sell.” It has to be “pulled” by the customer in many respects, not “pushed” from the vendor. And, nowadays, even large, complicated software systems once thought too large to be touched are falling prey to the same problems due to SaaS and (soon to be very popular) Cloud computing. Software sales reps are still vital to the equation, but in my opinion, their job is now harder than ever. The best ones will become consultants as much as sales reps, or they will gravitate to selling “services,” which for now at least, still maintains the characteristics of relationship selling. As promised in my first note on this topic, here is part 2 of Guy’s article on cloud databases, which include simple introductions into C-Store and H-Store technology. It’s a quick read and a great primer if you’re looking for a place to start. It may seem like it, but I’m really not picking on saas. Rather, I’m just trying to wrap my head around it from all angles, and in particular, in how one would “transition” to it from more traditional business models. Here I talked about the challenge of how customers think about their budgets. Another challenge comes up in terms of traditional sales model, as talked about here by Rod Drury, the New Zealand dynamo. It’s short, and worth a quick read if you are curious about what a company faces moving to saas offerings. About a year ago, my cousin who is a junior in college, wasn’t returning my emails. I got frustrated and sent her a text message. Within a minute, I had a response. After further dialog (we did actually “talk”) I found that email was “so 90’s” and that to keep up with her, I would need to social network. This led to a discussion at work where I predicted that this generation will not tolerate what we currently call “collaboration” in today’s workforce. Fast forward to today. Had a conversation with a customer who had a really sharp intern they wanted to hire. Kid politely says, “no thanks.” They ask him why and he said, “Everything’s great, but I can’t facebook.” This led the guy to poll his audience at a major college where he talks to Freshman classes about choosing a major. (he’s trying to spawn interest in IT). It was a class of about 450. Question: How many of you have email accounts? Everyone. Question: How many use their email accounts for social communication. Nobody. Question: How many of you would turn down a job offer if you didn’t have free access to the Internet? Half. Several have asked me for more information on the general concept of cloud databases and their impact on the database market. I would highly recommend this article written by a colleague of mine, Guy Harrison, who is one of the brightest minds in the database and development industry from a practical perspective. Meaning, Guy has the rare ability to distinguish theoretical hopefuls from probable actuals. As such, this article gives a nice, grounded view of all this talk about cloud databases. It’s part 1 of 2, so when the 2nd part comes out, I’ll let you know. CAPEX vs OPEX. The primary issue we encounter when positioning SAAS is an organisations budgeting process hadn’t planned for a SAAS offering. Many customers get a CAPEX budget approved in advance, then evaluate tools and on making their selection they need to spend the budgeted CAPEX. An OPEX based SAAS offering may be a good fit for them, but the requirement to go back and redo budgeting is so undesirable that almost always in this situation the customer will elect the CAPEX option. It’s not like it’s tough to overcome technically, but it will require a shift in budgeting philosophy. should oracle have bought mysql? I’ve talked a bit about MySQL and a commenter on that thread agreed that they are really well positioned to be a cloud player. Before Sun acquired them, it was public knowledge that Oracle had made a bid for MySQL. Marten Mickos, MySQL’s CEO, got pretty aggressive in the media against the bid saying they didn’t want to be acquired, but rather wanted to grow to be a strong, independent company. Then they were bought by Sun. I think Marten would make the argument that they ARE still a strong, independent *database* company, even though they are inside of Sun. And that does have some merit. But that said, MySQL was accountable to their investors and if Oracle had bid high enough, the deal would have happened. I was asked on a call the other day if Oracle screwed up by not making that deal happen. In the short-term, I don’t think so. But in the long term… I think they have a real threat on their hands. Cloud computing represents the biggest disruptive technology the industry has seen in a long time. Today, the cloud databases are not anywhere nearly as capable as their traditional counterparts. How much do they need to be? You can pretty much do everything you need in the app layer. It’s harder, but does have it’s benefits. But of all the “traditional” databases, MySQL is best positioned (I think) to move to the cloud effectively. First, I must say I’m glad I got a Mac for at least one reason: It has come up in 3 business conversations in the past few weeks. Mac seems to be making more inroads into organizations via executives. Interesting. So, that allows me to post it here under technology trends. For those that care, here’s an update on my experience after a few weekends of playing with my new iMac. 2) Spaces. Should be a requirement for any graphical interface. 3) Installs. Drop a file into a directory. I was hearkened back to my first experiences with Oracle when I realized how easy it was to install multiple database instances on a Unix box. 4) Uninstalls. Delete the file. Ahhhhhh. Gotta love that unix. 5) Webcam/photo booth. The quality of the built-in webcam on the iMac is really top notch. does great in low light, which every other webcam I’ve had does not. And Photo Booth is an amazing hit with my kids and their friends. They crack up in tears when I let them take shots of themselves with all those distortion effects. 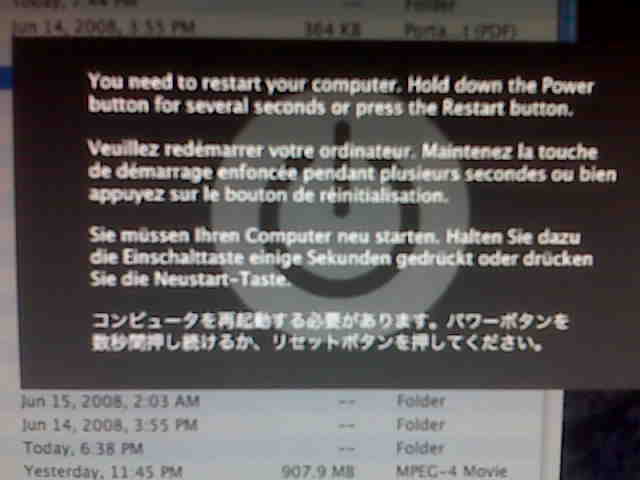 1) I hit the Mac version of the famed “blue screen of death”. Mac’s was prettier, and multi-lingual, and gracefully washed my screen dark grey before the error, but a fatal error nonetheless. 2) Mighty Mouse. Probably pure preference, but killed my index finger (how wimpy is that?) Switched to my logitech and all is well. 3) Keyboard shortcuts. I use the mouse very little when typing. I do all highlighting using keyboard shortcuts, but the ones on the Mac don’t always work on non-Mac native software apps (like in a web browser). Things like “quick highlight to the end of a line” can be frustrating. 4) Time Machine drive setup. This post says it all. The company who once ran a great ad busting on MSFT for the whole “c colon backslash” thing is talking about GUIDS and Partitions? Ouch. Need to find a way to make it more intuitive given who they are. On balance, I’m much happier now than I was a couple of weeks ago and am glad I made the purchase. When I get my copy of Final Cut Express and have time to mess with it, I’ll post back on that experience as that is the real reason (video editing) I bought it in the first place. A while back I posted some thoughts on the technical challenges of organic growth that generated some good discussion. At that time, I was looking at organic technical growth vs growth through acquisition. But there’s another angle to this, which is SaaS (Software as a Service). Bob Warfield has a really interesting post that details some of the same challenges I listed (which just about anyone who’s been in software for more than 5 years can list), but for him acquisitions aren’t the answer as they only delay the problem. For him, the answer is SaaS. SaaS does provide quite an appealing model, but I have to believe that the “Law of Unintended Consequences” is going to provide us some real fun with SaaS at some point in the future. Is it the next best thing? Sure seems like it. But I wonder how long before multi-tenant applications get too limiting in ways we maybe cannot see today?